Beam focusing has an important role to play in many spheres of technical optics. A single lens with a suitable focal length is the simplest solution. For even machining surfaces, a single lens is not sufficient, because the curved image plane requires repositioning of the focus. To circumvent complex movements, so called f-theta lenses are designed to compensate this position shift and provide an even image area. Additionally they feature a consistent spot size over the whole scanning plane. Telecentricity is an option which provides a perpendicular incidence on the working plane. Furthermore, it is desirable to enable large scan areas, as they allow treatment of larger work pieces without moving the optical unit or target. Some months ago we reported about the S4LFT4010 series in the Sill Optics newsletter 3/2017. This group of f-theta lenses for different wavelength regions from UV to IR offer comparably small spot sizes for increased fluence. The S4LFT4125/075 is an enhanced version for lasers with ultraviolet radiation and consists of fused silica equally. The scan area has been improved from 35 mm x 35 mm up to 50 mm x 50 mm. Despite the higher focal length a focal diameter of 8 µm (1/e²) can be reached inside the whole scan area with a 10 mm input beam diameter. Similar to the S4LFT4010 series the new lens (S4LFT4125/075) is diffraction limited for the specified input beam diameter. Furthermore there are no internal and external ghosts and therefore no back reflections nearby the scanner. In addition to the large scan area this property is another quality characteristic and the lens is therefore compatible with short pulse lasers. 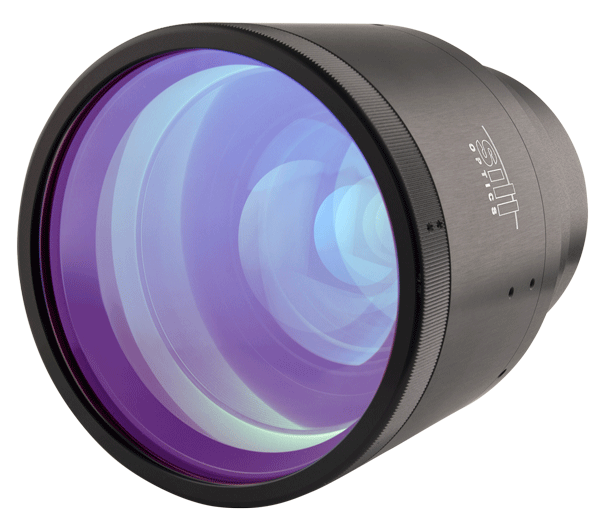 Sill Optics is also looking forward to adapt this lens to your wishes i.e. adaptation to other wavelengths.